I am not sure what your lifestyle entails, but mine does not require me to travel all that often. However, when I do, I have often found a problem. That problem is my toothbrush gets put into my travel bag or wash bag but it is not protected. The brush head is free to come into contact with any dirt or germs that are in the bag as well as brush along other items in my bag such as a razor, maybe some tablets, deodorant etc. It can get dirty but also damaged. Basically throwing it in the wash bag is far from ideal. Sometimes I put it in a little carrier bag and wrap that tight around it, but this is not exactly the best option. The handle to my brush is a bit more robust and I am less worried about what it comes into contact with, but it stands the chance of accidentally being activated. The problem here is you arrive at your destination to find you have no charge in your brush (with no charger) or at some point on your journey (normally when going through security at the airport) you have to explain the buzzing coming from your bag! There needs to be a good solution to stop these issues. In part there is, the travel case. In this post, we therefore look at the best travel cases for a manual brush, as well as the best travel cases options for electric toothbrushes. Available for both manual and electric toothbrushes, there are ways and means of protecting your brush when travelling. Neither manual or electric typically come with a travel case. 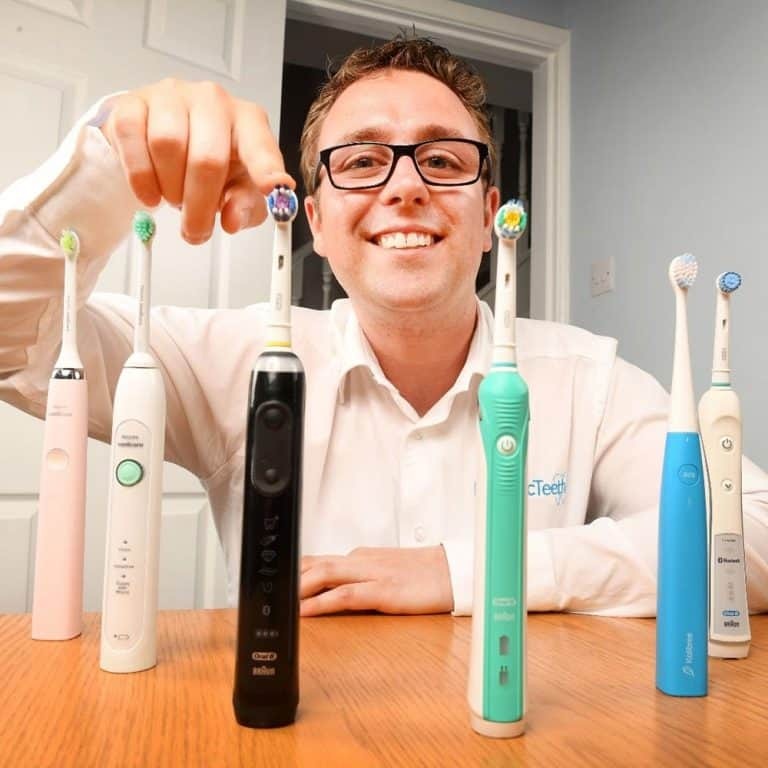 There is a higher likelihood of getting one with an electric toothbrush, but if you do, that is normally because you have bought a premium model. If you do travel a lot and want a toothbrush that is particularly good for travelling, we list a range of options in our best travel toothbrush post. If you already own a toothbrush but don’t have a travel case, see our recommendations below. I might not need to spell these out to you, but here they are anyway. Protects the brush handle and head from damage in transit. Protects the brush handle from accidental activation (if electric). Makes it easier to transport, grab one item from the bag rather than multiple bits. Provides storage for more than one brush head. A case may protect the brush in transit, but here are some of the drawbacks. Can be quite expensive to purchase given the limited use it might get. Getting the right one for your brush, not all are a universal. Getting one that accommodates the charging stand too. Finding one that holds more than 2 brush heads, if you are a family for example. Product quality, some are really cheaply made. Bulky, some are quite large and take up a lot of space. You may have additional queries or concerns about a travel case. Read on and I hope that there will be at least one travel option for your toothbrush that will work and at least solve a few of the drawbacks. I want to point out that some brushes come with their own style cover. Unlike a case which may surround the whole toothbrush, some models, particularly those from Colgate come with a form of case, that acts more like a cap or sleeve to the toothbrush. These generally slide down over the brush head, and down over the handle and as a minimum provide a rigid protection around the brush head and over the function buttons for the electric toothbrush. For a manual brush, these caps or covers clip around just the brush head itself, encasing the most delicate part of the brush. The benefits of such a cover is that the brush profile remains slimmer and lighter. It is a cheaper option too. However, the drawbacks are that additional heads are not protected, charging stands can not be carried (with electric toothbrushes) and these are specific to the model (universal fit for manual brushes). They normally come with an electric toothbrush and cannot be purchased as accessories, although they can be for manual brushes. PLEASE NOTE: Some brush heads, particularly those offered by Sonicare, when new, do come with a very small clear plastic cap that does mount to the brush head over the bristles to protect them clipping to the back of the head. These are essentially covers/caps that can be used at a later date as a means to protect the brush head, but they are easily lost due to the small, clear design and do not provide all round protection. Which manual toothbrushes come with a travel case? Very few manual toothbrushes come with a travel case included. There are some travel style manual brushes that include a case, but these are specifically designed for travel and are often smaller. Most manufacturers expect the travel case to be purchased separately, often this is because of cost. Most manual toothbrushes are very cheap compared to the premium electric alternatives, where the provision of a travel case is included. Which Oral-B electric toothbrushes come with a travel case? The following brushes from Oral-B come provided with a travel case in the box at the time of purchase. All with the exception of the Genius 9000 come with a very basic, but functional thin hard plastic moulded case that will hold the brush handle and up to 2 brush heads. The 9000 has a premium travel case that looks and feels better, hold a brush handle and 2 brush heads but also can be charged in the case as well as charge a USB powered gadget at the same time. Although designed for the Genius range it works with other brush handles too. 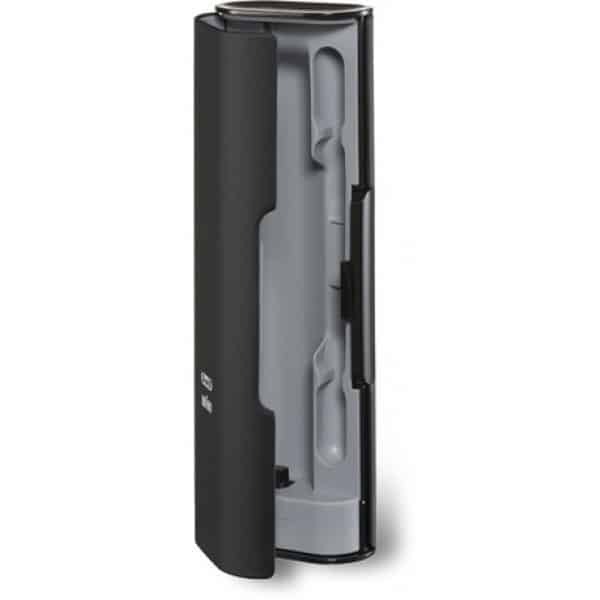 Read more in the Braun/Oral-B D701 USB Travel Case section later in this article. Which Sonicare electric toothbrushes come with a travel case? The following brushes from Sonicare come provided with a travel case in the box at the time of purchase. The DiamondClean comes with the best travel case. Unlike all the others that are fairly basic hard plastic cases, that hold a handle and 2 brush heads, the DiamondClean comes with a premium case that not only is a little larger and more robust, but looks and feels better. Its winning feature is the fact is can be charged via a USB cable in the case. Connect it to your computer, or a USB socket or a conventional mains socket (adapter required). It does not have to connect to a 2 pin socket in a bathroom, but it can. Who offers better travel cases Sonicare or Oral-B? Both offer a cheap and premium solution depending on your model. However, the cheaper case found in a higher number of boxes with the electric toothbrush is of a better construction from Philips Sonicare. It feels more sturdy and robust and like it will stand the test of time better than the thinner and slightly more flimsy option from Oral-B. There is less difference in the premium travel case that comes with either of their most premium models, they are similar yet different, but if I had to pick a winner it would be Sonicare again. Their premium travel case allows the brush to be charged in the case, as Oral-B’s does. However and most importantly, the Sonicare can charge from a USB port on your computer or from a mains adapter like you might your smartphone, making it more appealing and versatile in today’s connected world. Oral-B’s you must connect to the same 2 pin outlet you would any other toothbrush, but once connected you can charge another USB powered gadget by connecting it to the travel case. The idea is you charge your brush and smartphone at the same time! What’s the best travel case for my toothbrush? Like any product there are a variety of different options, so in this article I will be reviewing the best travel cases available, highlighting the pros and cons of each and hopefully allowing you to decide on the best travel case for your toothbrush. It is unlikely that there will be a solution that works for everyone as even with a travel case we have different needs, but hopefully I can highlight some potential options for you. In no particular order, here are the some of the best options if you’re choosing a travel case for your manual toothbrush. A simple and cost effective solution this frosted case will hold one manual toothbrush and protect it when in transit (view on Boots). It opens in the middle by pulling the 2 parts away from each other and can be closed by pushing the 2 parts of the cover back together again. Most manual brushes will fit in here quite snugly. Particularly small brushes may move about whilst some oversized manual brushes may not fit. Suitable for 99% of manual brushes. Simple, functional and cost effective. Ideal for a family this pack contains 4 differently coloured covers that fit to most toothbrush heads (view on Boots). They are designed to clip round just the head (the bit with the bristles) and protect them from damage in transit. By clipping this to your brush head when you are on the go, you can be assured that not only is your brush head not getting damaged or picking up any bacteria or dirt from inside your bag or wash bag, you can also be assured that the brush is not leaving any moisture or residue on the other items within your bag. Some heads may not fit due to their design, but like the other travel cases, they will fit around most brush heads. A nice set of 5 different coloured (Blue, Green, Purple, Pink & White) brush head covers, that work out at around 50p each (view on Boots). Advertised as being compatible with manual and electric toothbrushes. HOWEVER be warned they do not work with Oral-B or Sonicare electric toothbrushes and are truthfully best suited to manual brushes only. The maximum brush head size that fits inside the cover is 3.5 x 2.2 x 1.6cm and the neck of the toothbrush must not exceed 0.7 x 0.6cm in thickness and width. For heads smaller than this the cover wobbles a bit on it but remains fastened around it. They are not the most sturdy of cases, but thick enough that they do the job, but are certainly at the more basic level. Each side of the cover has 3 vents to allow airflow into the cover. They fasten shut with a small plastic clip that keeps the two sides of the cover fastened when pressed together. Ignore the compatibility with electric toothbrushes and these make for simple, colourful and effective covers. Available in a range of colours (Light Blue, Blue, Rose, Green, Pink, Purple, Yellow & Orange) this is a simple no nonsense cover for a manual brush (view on Amazon). This case covers the whole brush and not just the brush head. Whilst the construction is good and it certainly does the job, for the very low price do not expect the ‘best’ quality. You get what you pay for really. For the adhoc or fairly infrequent traveller, this will do the job well. Even regular travellers will get good value from this. It is made of a hard plastic, with a little flex so it can take a bit of an impact whilst still protecting the brush. The case pulls open to give you 2 parts and then pushes shut by lining the two together. When in a bag inside this case, you can be assured that your brush will not get damaged, nor will it get dirty and you won’t be leaving a trail of moisture residue across your clothes and other items in the bag. Measuring 21.5 x 3 x 2cm the case has a nice rounded design to give a softer in hand feeling and makes it nice to grip onto. The largest of the covers we have tested, this is more than just a travel case for your toothbrush. You can even get a tube of toothpaste in with your rush in this case (view on Amazon). Nobody wants toothpaste spilling out all over the contents of your bag, it can happen and it makes a right mess if it does. With this travel case, put both the brush and the paste inside for safe transportation. Available in Blue, Pink, Candy Green and Green this measures 4.4cm in diameter by 20.8cm high. It is large enough that you could even get an electric toothbrush in here, if you remove the head. Opening into two parts, the bottom of this travel case can be used as a travel cup to hold you toothpaste and brush in but to drink out of if you needed. The top of the cover has a few holes which allows for airflow and ensures a damp brush can dry out whilst also ensuring that everything is protected when not in use. Although a little bulkier, perhaps an all round more practical solution. A more universal design this travel case measures 12 x 8.5cm and can hold a brush and a smaller tube of toothpaste. You might be able to squeeze in a flosser if required too or instead of (view on Amazon). When you buy these it is a bit of a lucky dip in terms of what you get as the colours are said to be random although images of a pink and blue case are shown on the product page. I received pink and yellow. Very cost effective considering you are getting 2 cases included in the package, the quality is not as good as the more expensive options but perfectly strong enough for what most travel cases are going to be exposed to. Most importantly it keeps your brush safe and secure and stops the bristles from becoming damaged. Much squarer in design the case feels fairly solid in the hand and hinges open on one of the longer edges. There are 2 small clips that you lock and unlock as you open or close the case. If it’s an electric toothbrush you own, we’ve included various options below having completed our own hands-on testing. Designed for Oral-B Pro series brushes, the larger Pro/SmartSeries 6000, 6500 and 7000 along with the Genius range will not fit within this case (view on Amazon). Similar to the Oral-B original basic plastic travel case this is not of the ‘best’ quality but it is more than adequate and functions as you would expect. It holds a brush handle and up to 2 brush heads securely in place. There is no room to hold or transport a charging stand within it. The size of this travel case is 21 x 7 x 4.5 cm, with a rounded design on all edges. Smooth sweeping edges help with the look and feel of the case but also keep the size down, to limit the amount of space taken up in a bag. The case is transparent so you can see what is inside and for added strength inside the lid are small mouldings that reinforce the upper edges of the case should there be impact of pressure applied. Air holes ensure some air gets into and out of the case to help reduce any moisture presence and keep the air inside the case fresh. On one edge is a clip that can be pushed into place to hold the top and bottom part of the case securely closed. This appears to be strong and does not appear to easily come apart. You will of course need to unclip this to gain access to the contents internally. A simple but perfectly adequate plastic travel case, the rounded and transparent design make this a functional product (view on Amazon). Essentially identical to the Nincha looked at above, with the inclusion of a suction cup support that goes around the brush handle, problem is, it does not fit or seem to serve any purpose. It delivers the basics of what you need from a travel case. Able to hold 1 brush handle and 2 brush heads, this case has a bit of a no frills design and approach but that is commendable. It is marketed for Oral-B and Philips, out of all the brushes I have on hand only the Oral-B Pro series models fitted. None of the Sonicare handles did, nor any of the larger Pro/SmartSeries 6000, 6500 and 7000 along with the Genius. So be warned. The plastic is of a higher grade and quality than the basic travel case provided by Oral-B in my opinion. Both the long and the short edges are rounded to give this a softer look, reduce the overall size of the case and build strength into the top and bottom with the curved shape. Keeping your brush and brush heads clean and protected when travelling you can be assured of them being in one piece when you get to your destination. There is a secure plastic closure on one side of the case that needs to be clipped and unclipped into place as you open and close the case to ensure the contents remains inside and the case closed. Essentially identical to the Poketech travel case described above, but rather than being see through, this case is white in colour, which means the items contained within the case cannot be seen (view on Amazon). It can be purchased in the white colour shown but pink and blue too, all of which have more of a glossy colour finish rather than a matte finish to them. A simple but perfectly adequate plastic travel case, the rounded design, complete with side mounted clip to keep the case closed. make this a functional product. The plastic is of a higher grade and quality than the basic travel case provided by Oral-B in my opinion although I am not sold on the glossy finish. It is marketed for Oral-B, but Pro/SmartSeries 6000, 6500 and 7000 along with the Genius range will not fit. If you have a Pro/Trizone 600, 650, 2000, 3000, 4000, 4900, 5000 and 5800 you will be ok.
Also included is a suction cup support that goes around the brush handle, problem is, it does not fit or seem to serve any purpose. Keeping your brush and brush heads clean and protected when travelling you can be assured of them being in one piece when you get to your destination whilst also knowing that the air holes that exist have allowed moisture to dry out and avoid the build up of stale air inside the case. A transparent hard plastic shell, that opens up in a way you would expect of a case, inside is a silicone moulded storage tray/compartment that has recesses for 1 brush handle and 2 brush heads (view on Amazon). It is said to be compatible with a wide range of brushes from Oral-B to to Sonicare and we found this to be true, however some larger handled models may not fit correctly, these include the SmartSeries 6000 and 650 along with the Genius range from Oral-B. All sonicare models we tested were fine. As per other Poketech cases we have tried this came with the suction cup support, but due to the design of this case it was practical and useful with slimmer handled brushes like the Pro range from Oral-B. It reduced the movement of the handle in the case. The tray which holds the parts is available in either a blue, green, pink or purple colour option to suit your style. Well built when closed, the top cover securely clips to the bottom half of the cover and holds the items fairly securely inside. There are not air vents and holes in the case allow for airflow to ensure moisture dries out. Accommodating no more than 2 brush heads and 1 handle, there is not space for a charging stand or any other accessories. The longer edges of the case are rounded, for a softer look and feel but the shorter edges are squarer in design to give it a robust look and design. The top and bottom of the case do too have an outline of a toothbrush etched onto the case. This is a slightly different design to most travel cases seen for electric toothbrushes and one we like for the more universal nature of its design (view on Amazon). Many sonicare models would fit too. It is large enough to hold the brush handle, a couple of heads and the charging stand. Therefore this case is much larger than most. Hinged on one side the case opens up like a book and has a zip to close it. There is even a hand strap provided that clips onto the case, should you want this for easy grip of the case. Inside, one half of the case has an elasticated strap to fit around and hold in place the brush handle whilst the other side has an elasticated strap and a small mesh pocket. This case is strong enough to take a few knocks for sure and is roomy enough to get more than you would in most other travel cases. The main downside here is the same thing that makes it appealing. The universal design means things can rattle about in the case. A nice touch is 2 small plastic covers for Oral-B brush heads that protect the bristles from rubbing against the soft internal material. Lightweight and attractive, the case measures 20.3 x 5.6 x 5cm. Similar to the travel bag by Khanka explained above this travel case is advertised for the Oral-B Pro 1000 but is large enough to accommodate many more models, including th the Pro 600, 1000, 2000, 2500, 3000, 4000, 4900, 5000, 5800. Trizone 600, 2000, 3000 & 4000 (view on Amazon). It even fits the larger SmartSeries 6000/6500 and the Genius range, which most others do not. All sonicare models would fit in here too, however the 2 plastic brush head covers that are provided would not fit Sonicare brush heads. The case has a softer touch to it and is not made from hard plastic like many others. A carabiner is also included. Sealed shut via 2 zips, this black coloured case has a soft inner lining and 2 large compartments, one either side as the case is opened up like a book. One compartment has a mesh pocket that stretches about a third of the length of the case whilst the other compartment has 2 elasticated straps that clip together to secure the contents inside. A large case the universal design makes it easy to put items into it and not have to fuss about positioning everything perfectly as the space is provided. Cables and brush heads can be tucked into the mesh pocket whilst brush handles can be strapped down. 2 clear plastic brush head covers are included. These are basic but functional additions to stop the bristles on the head becoming damaged. These clip to the Oral-B heads. The universal design and fit of this case is very appealing, sadly very few brushes fit inside it (view on Amazon). Not one of the current range of Oral-B models fitted. Our sonicare models did, just. This I think has been designed for smaller/older brushes not available in Europe. It provides a place for the brush handle and up to two brush heads, much like an official case from either brand. Measuring 22 x 7.5 x 4.5cm, the case is only a bit bigger than most electric toothbrushes. Made from a robust plastic this feels like it could take a good few knocks and the plastic clip that securely fastens the case closed appears to be strong and should stand the test of time. The case hinges open from one side, like a book and inside you will see moulded grips and channels for positioning the brush and heads. Channels and vents help ensure airflow gets into the case but also ensures no moisture gets out meaning even a damp toothbrush can dry out when in the case, but not ruin the contents of the bag. White in colour it is inoffensive but the solid colour means you cannot see what is inside when the case is closed. Basic but functional, there is no denying that this is an expensive item given what it offers (view on Shavers.co.uk). Why so expensive? Because it’s the same one that comes with many of the previously mentioned Oral-B toothbrushes. Their equivalent to the universal case, it will accommodate most, but not all models from Oral-B. Suitable for models such as: Pro 600, 1000, 2000, 2500, 3000, 4000, 4900, 5000, 5800. Trizone 600, 2000, 3000 & 4000. Brushes that will not fit include the Pro/SmartSeries/Trizone 6000, 6500, 7000 and the Genius range as well as older Triumph models. It will hold one brush handle and up to 2 brush heads. An almost transparent plastic, it allows you to see inside and gives good protection to the contents. A rounded design makes for a more comfortable grip and helps give strength to the case. Given the price, it is not the best quality in terms of plastic thickness or rigidity, but will withstand the stress that a case should usually be exposed to. An original Oral-B accessory, that was designed for and supplied with the Genius range of brushes. However, our own hands on testing has confirmed that other Oral-B Pro and Smart handles actually fit in the case and charge too (Not Pro/SmartSeries 6000/6500). The fit is not ‘perfect’ with a bit of handle movement, but the handles sit in place well enough to charge and be protected. This case is available in Black, White and Rose Gold. 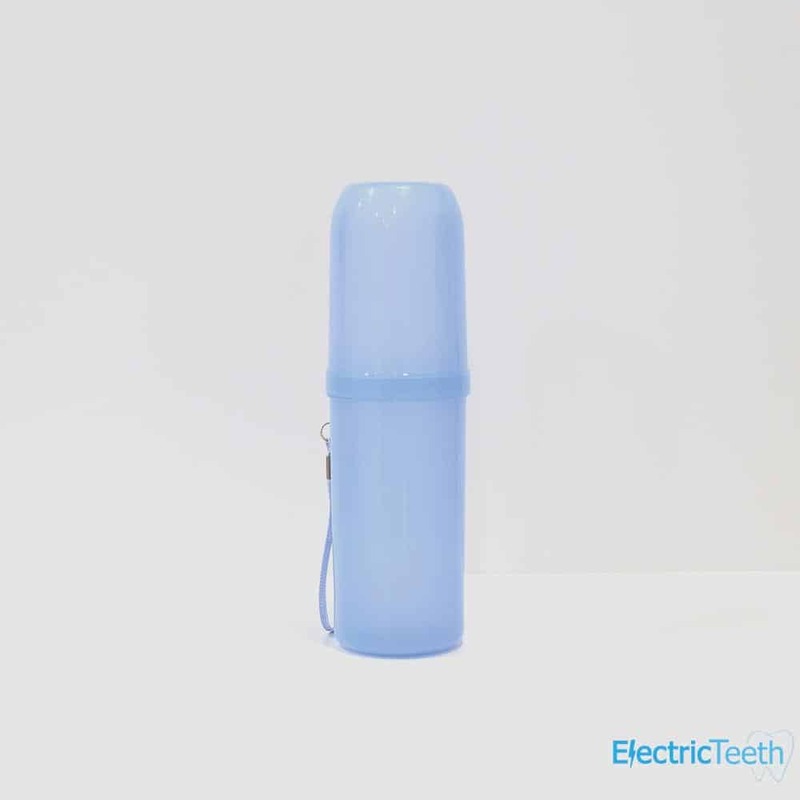 The case holds the electric toothbrush handle and up to 2 brush heads. A premium case it is solid with a secure fastening. A proprietary power connector, allows for the brush to be charged in the case, providing the power lead (sold separately) is connected. A USB port on the case then allows for power passthrough to the likes of a smartphone. 2 plastic clips in the lid of the case offer up a position to hold the smartphone in place. Buy the D701 USB case in Black, White or Rose Gold. You will require a power adapter which is available in Black or White. Where to buy travel cases for toothbrushes? The best variety of options are via online retailers. Some specialist high street stores like Boots do sell travel cases and caps, but the variety is limited. With all of the options shown in this article, purchase links have been provided so, you can follow those links to go and buy online today, if one of thee suits your requirements. Where can I buy an Oral-B or Sonicare original travel case? Your brush may or may not have come with a travel case included in the box. Sadly, to purchase an official travel case is not all that easy. So if your brush did not come with one and you want one made by Sonicare or Oral-B it might be a challenge. However it is worth checking out shavers.co.uk who sell manufacturer original parts, you might just be surprised at what you can find. There are a variety of different options manufacturer’s have in evolving the travel case for a toothbrush. Much of what will be decided will be based on each brand’s vision and the demand they have. The basic plastic travel case has and does continue to be an excellent solution, but the premium cases offered by the DiamondClean and the Genius range show how things can be more elegant and useful. I would like to see more premium quality travel cases that allow the brush to be charged in the case. However , it would be better if the brushes charged in the case without proprietary charger, i.e. using a more universal connector. Sonicare are close with this, but still use the aged Mini-USB rather than the more current micro USB or the newest USB Type-C connector. A case with a battery in it would also be useful, so that brushes could be re-charged from that battery and maybe even other devices like phones could be connected to the case for charging, without the need for the case or phone to be connected to mains power. Not the easiest solution, but one I would like to see, from a third party brand is a universal, premium travel case that would hold an Oral-B, Sonicare or even Colgate toothbrush and could charge it in the case. It would be a case you would buy separately, but know it would work with a variety of toothbrushes, should you change your brush. Read this article and have something you want to add or say? Great, please leave your comment below for all to read. Feedback, good or bad is appreciated as are any comments that may help others that read this post. It’s good to hear from someone that has the same problem as myself. Recently, I bought an electric toothbrush from Woolworths. The problem is, that I can not find a toothbrush case large enough to house my toothbrush in. The toothbrush actually measures 22 cm in length. Can you advise where to buy a suitable toothbrush case that is ( hopefully ) longer than 22 cm ? Is that 22cm measurement with the brush head attached or not? Can you tell me what electric toothbrush it is you bought. Do you know the brand and model?